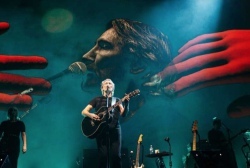 Some great news for our friends in Brazil - a second night has just been announced for that country as part of the Roger Waters 2018 Us + Them tour, with tickets just about to go on sale. This additional concert on the schedule brings Roger's 2018 tour to 88 performances. The regular sale of tickets starts tomorrow, Thursday April 19th, via Ticketsforfun.com.br or the direct links below [click 'TICKETS'].